Nat Bletter of Madre Chocolate has announced the first “Cacao Bootcamp” to show chocophiles, chocolate makers, and cacao growers the “seed to tree” and “bean to bar” process of chocolate that they rarely get to see. 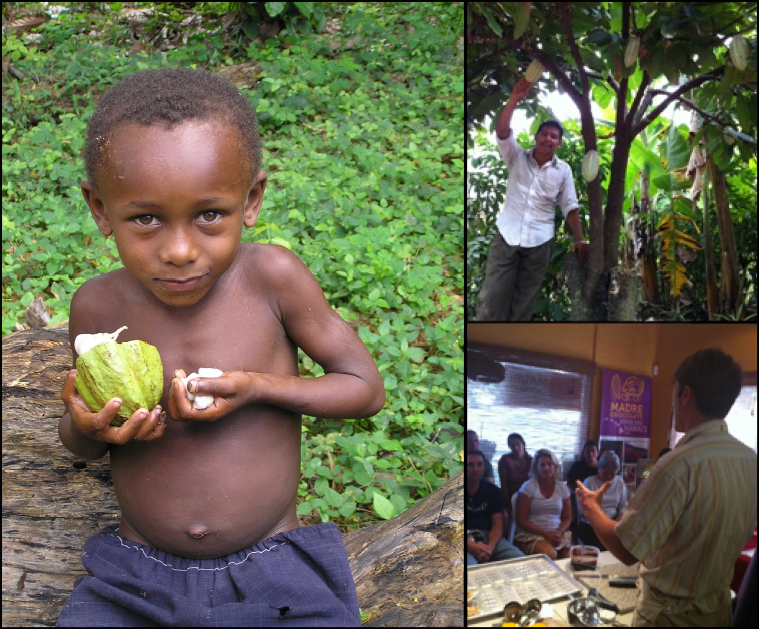 The “Experience Hawaiian Cacao & Chocolate Bootcamp” will be held October 20-24 2013 across several cacao farms, research stations, and chocolate shops on Oahu. Join us for 5-days in paradise on a journey for chocolate. Practice farm skills in cacao orchards, visit with cacao researchers and farmers, learn about fermentation and drying for cacao, get hands on with bean to bar chocolate. Do you love chocolate and thirst to learn more about how cacao is grown and made into chocolate? Never tasted the delicious lychee or mangosteen-flavored pulp of the cacao fruit? Want to see how the days-long process of fermenting cacao affects the micro-terroir of the chocolate flavor? This is the perfect tour for you! We’re having a cacao boot camp with everyone from Hawaii, mainland, European, and beyond chocolate makers and chocophiles coming out here to experience and learn cacao planting, cultivation, harvest, and fermentation and chocolate making for 5-7 days. We’ll introduce you to the cacao growers and fermenters throughout Oahu, an area we call the Napa Valley of cacao due to the amazing diversity of cacao flavors and microclimates in each valley up and down Windward Oahu and the North Shore. Each day we’ll visit, learn, and participate in a different aspect of cacao growing and processing with expert farmers, fermenters, agroforesters, university researchers, and chocolate makers in Hawaii’s burgeoning chocolate industry. In the only place in the US where cacao grows, you’ll have beautiful accommodations near the beaches of Lani Kai and Kailua or famous Waikiki, and you’ll be driven between each of the spots each day, with time off in the evenings to enjoy all the amazing local food that Kailua and Honolulu has to offer. All Ground Transportation – Field Trip, Farm Trips, Sunset Beach Trip, Airport Pick-­‐Up and Departure Drop-­‐Off, Scheduled Program Activities. For best transportation we request that participants stay with our lodging partners. Breakfast Daily at lodging partner and Lunch Daily with group. Options for vegetarian, vegan and special dietary needs are available upon request. Raw Materials for Chocolate Making in Program, Field Note Book for Farm Trips, Chocolate for Tasting Sessions and Cacao Pods for fermentation practice. Workshops, Farm Tours, Facilitators and Instructors, Private Group Transportation and a real fun time. Photos courtesy Nat Bletter/Madre Chocolate.